A new low-temperature solution printing method allows fabrication of high-efficiency perovskite solar cells with large crystals projected to reduce current-robbing grain boundaries. The meniscus-assisted solution printing (MASP) method increases power conversion efficiencies to approximately 20% by manipulating crystal size and orientation. The process, which employs parallel plates to develop a meniscus of ink comprising of the metal halide perovskite precursors, could be scaled up to quickly generate large areas of dense crystalline film on a range of substrates, including flexible polymers. Operating parameters for the fabrication process were selected by using a comprehensive kinetics study of perovskite crystals observed during their formation and growth cycle. We used a meniscus-assisted solution printing technique at low temperature to craft high quality perovskite films with much improved optoelectronic performance. We began by developing a detailed understanding of crystal growth kinetics that allowed us to know how the preparative parameters should be tuned to optimize fabrication of the films. The new method is described in the July 7th Nature Communications journal. The research has been supported by the Air Force Office of Scientific Research (AFOSR) and the National Science Foundation (NSF). Perovskites offer a striking alternative to traditional materials for trapping electricity from light, but current fabrication methods usually produce small crystalline grains whose boundaries can capture the electrons produced when photons strike the materials. Present production methods for preparing large-grained perovskite films normally require higher temperatures, which is not advantageous for polymer materials used as substrates – which could help minimize the fabrication costs and allow flexible perovskite solar cells. 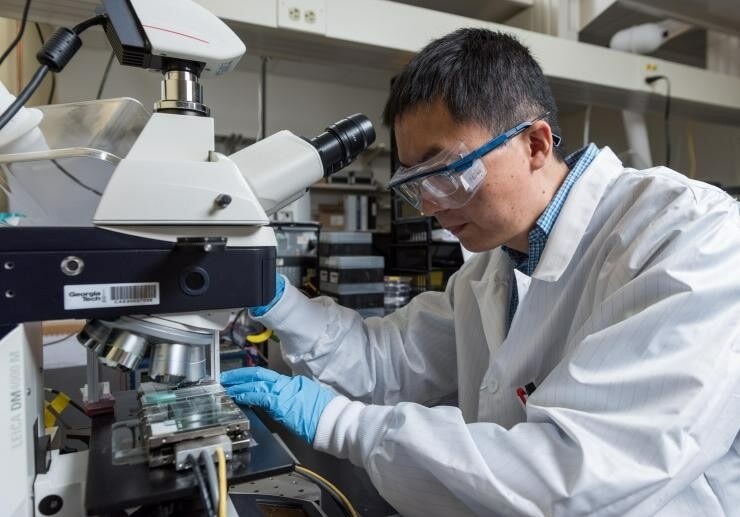 So Lin, Research Scientist Ming He and colleagues planned to try a new methodology that depends on capillary action to pull perovskite ink into a meniscus formed between two almost parallel plates about 300 μm apart. The bottom plate moves constantly, allowing solvent to evaporate at the meniscus edge to develop crystalline perovskite. As the crystals form, fresh ink is pulled into the meniscus using the same physical process that forms a coffee ring on a porous surface such as paper. Because solvent evaporation triggers the transport of precursors from the inside to the outside, perovskite precursors accumulate at the edge of the meniscus and form a saturated phase. This saturated phase leads to the nucleation and growth of crystals. Over a large area, we see a flat and uniform film having high crystallinity and dense growth of large crystals. To create the ideal rate for moving the plates, the distance between plates, and the temperature used on the lower plate, the Researchers examined the growth of perovskite crystals during MASP. Using movies take through an optical microscope to monitor the grains, they discovered that the crystals first grow at a quadratic rate, but slow to a linear rate when they began to impinge on their neighbors. The MASP process produces relatively large crystals measuring 20 to 80 μm in diameter that cover the substrate surface. A dense structure having fewer crystals reduces the gaps that can disturb the current flow, and decreases the number of boundaries that can capture electrons and holes and allow them to rejoin. Using films formed via the MASP process, the Researchers have constructed solar cells that have power conversion efficiencies averaging 18% – with a few as high as 20%. The cells have been examined with over 100 hours of operation without encapsulation. “The stability of our MASP film is improved because of the high quality of the crystals,” Lin said. Doctor-blading is one of the conventional perovskite fabrication methods in which elevated temperatures are applied to evaporate the solvent. Lin and his colleagues heated their substrate to just about 60 °C, which would be potentially well-matched with polymer substrate materials. Up to now, the Researchers have created centimeter-scale samples, but they believe the process could be expanded and applied to flexible substrates, potentially enabling roll-to-roll nonstop processing of the perovskite materials. That could help bring down the cost of manufacturing solar cells and other optoelectronic devices. The meniscus-assisted solution printing technique would have advantages for flexible solar cells and other applications requiring a low-temperature continuous fabrication process. We expect the process could be scaled up to produce high throughput, large-scale perovskite films. Some of the subsequent steps will include fabricating the films on polymer substrates, and assessing other unique properties such as piezotronic and thermal of the material. This research was supported by the Air Force Office of Scientific Research and National Science Foundation.